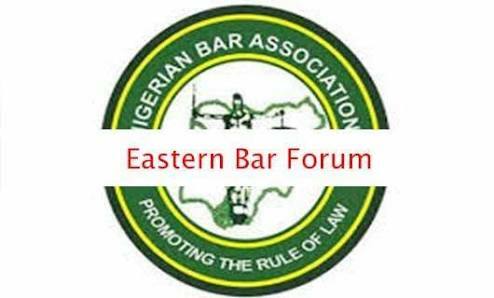 The on-going saga of the Eastern Bar Forum took yet another ugly twist. Despite key members of the Eastern Bar Forum from the Uyo and Port Harcourt bars categorically issuing statements dissociating themselves from the EBF’s adoption plot, Arthur Obi Okafor SAN was named by the divided forum as the sole Presidential candidate for the Nigerian Bar Association. Who is deceiving who here? Why would the EBF despite warnings and a boycott from key members of the forum still go ahead to adopt Arthur Obi Okafor SAN? Would this be allowed to stand by the NBA? I hereby categorically state and describe as a travesty of basic democratic principles the purported adoption of a certain aspirant today at the NBA Port Harcourt Branch House as the candidate of Eastern Bar Forum for the Presidency of NBA. I wish to state categorically that Uyo Branch of the NBA dissociates itself from such clearly unpopular and controversial development. As a matter of fact the Uyo Branch chairman and other delegates staged a walk out on the purported Screening Committee Meeting of EBF which was boycotted by all but one aspirant at Hotel Presidential by 7am before the Quarterly Meeting. The Chairman's principled stance was predicated on the fact that such activity contravenes the position of the National Exco of the NBA against such political activities for national offices when the ban on politics has not been lifted in addition to failure to afford a level playing field to all would be contestants from the zone. I wish to note that the open rejection, commotion and massive walk out which greeted the attempt to impose an aspirant on legal practitioners from the zone is symptomatic of the divisiveness of such ill-advised project and its capacity to splinter the forum. The Uyo Bar insist on a level playing field for all lawyers from the zone who have intention to contest any office when the ban on politics is lifted and the Branch had never taken a position on any candidates. This will show respect to the incumbent National Exco and avoid any exercise in futility. The Uyo Bar notes that the so called process of adoption was flawed in many ways. At the meeting Hall for instance no one was allowed to raise a point of observation or counter motion.The only people allowed to speak were people ready to rubber stamp the said motion for adoption. For these reasons and the sake of the future of the EBF I call all fellow members to support only what is legitimate, transparent and capable of uniting us.